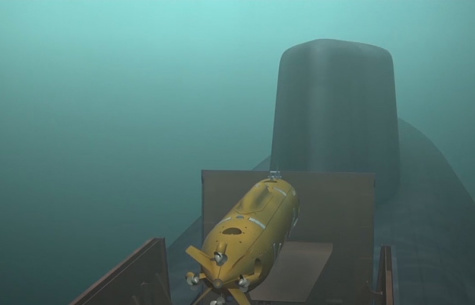 MOSCOW --- Russia’s Poseidon underwater drone currently under development will be able to carry a nuclear warhead with a capacity of up to 2 megatonnes to destroy enemy naval bases, a source in the Russian defense sector told TASS on Thursday. "It will be possible to mount various nuclear charges on the ‘torpedo’ of the Poseidon multipurpose seaborne system, with the thermonuclear single warhead similar to the Avangard charge to have the maximum capacity of up to 2 megatonnes in TNT equivalent," the source said. With its nuclear munition, the underwater drone "is primarily designed to destroy reinforced naval bases of a potential enemy," the source said. Thanks to its nuclear powerplant, the Poseidon will approach the target for an intercontinental range at a depth of over 1 km and at a speed of 60-70 knots (110-130 km/h), the source said. As another source in the defense sector earlier told TASS, the Poseidon drone will join the Russian Navy under the existing armament program for 2018-2027 and will be carried by a new specialized submarine currently under construction at the Sevmash Shipyard. The project of developing the Poseidon drone was unveiled by Russian President Vladimir Putin in his State of the Nation Address to the Federal Assembly on March 1. The Russian leader said that these drones could be armed with both conventional and nuclear munitions and would be capable of destroying enemy infrastructure, carrier-led naval taskforces and other objectives. Russian Navy Commander-in-Chief Sergei Korolyov later said that the new weapon would enable the fleet to accomplish a broad range of missions in waters adjacent to the enemy territory. According to the chief naval commander, the trials of the drone’s basic element, the small-sized nuclear powerplant, have already been carried out. Poseidon drones together with their carriers make part of the so-called oceanic multipurpose system. The drone got its name following the results of open voting on the website of Russia’s Defense Ministry.